The creation of Mad Scientists’ #15 actually began back in July 2012, when Sixpoint Brewery neighbors, Jessica Quon and Sabrina Valle of The Jam Stand, came in to collaborate on a pilot brew. The jam artists worked with the Mad Scientists to infuse jam into beer on the experimental, half barrel pilot system, reserved for innovation on the small scale. Our Belgian Abbey Ale yeast was a nice accompaniment to the girls’ Razzy Gabby raspberry-jalapeño jam. The “BelJam” brew turned out to be delicious and complex, and demanded a role in the Mad Scientists’ Series. The Jam Stand creating their Razzy Gabby with a side of Jalapeño Jam. Since a number of Mad Scientists’ brews were already in the works, it’s taken until now to re-energize this Red Hook collaboration. Jessica and Sabrina crafted a batch of jam expressly for Sixpoint, and with their help raspberries and jalapeños met light hops and sturdy malt to create a unique spicy-sweet and tart brew. The Mad Scientists also used 84 lbs of additional raspberries from Red Jacket Orchards in Upstate New York. Red Jacket makes an excellent partner, considering that their cloudy, cold-pressed and unfiltered juices are craft creations of their own. The brew may be even better than last year’s pilot – the spiced character of the Belgian yeast wraps up in spicy jalapeño, gives way to a center of lightly toasted bready malt topped with a dollop of raspberry jam, before the finish flourishes a snap of dry heat. When unceasing innovation meets boundless positivity the results are remarkable. 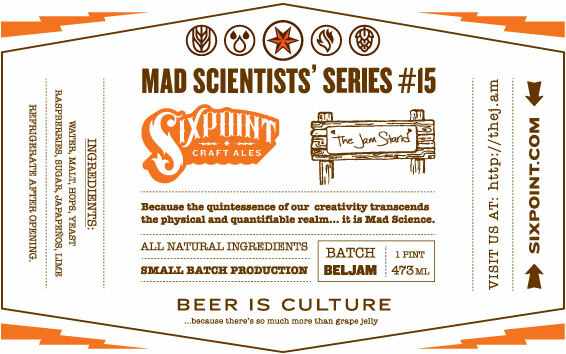 Jam out with Sixpoint Mad Scientists’ Series #15 starting this week.